RICHMOND has consolidated top spot on the ladder, withstanding a fierce challenge from one of its most serious challengers, Sydney, to prevail by 26 points in a gripping contest at Etihad Stadium on Thursday night. After taking the lead for the first time at the 26-minute mark of the opening quarter, the Tigers were never headed, but the Swans gave them an almighty scare when a Lance Franklin goal cut the margin to four points in the opening minute of the final term. Richmond had led by 22 points late in the third term, but late goals to Will Hayward and Franklin cut the margin to 10 points at the final break, and then Buddy's last-quarter goal appeared to give Sydney all the momentum. However, the reigning premiers then asserted their authority, holding the Swans scoreless for the rest of the game while they piled on the final three goals to seal a 14.9 (93) to 11.1 (67) victory and underline the fact they remain the team to beat in 2018. Jack Riewoldt (three goals) was the hero for the Tigers, turning on a vintage display in attack. His total of 16 marks was six more than the next best player on the ground, while seven of those marks were contested. The Tigers' win was soured with Reece Conca suffering a horrific injury early in his 100th game. Conca's left ankle became trapped at an awkward angle underneath Lance Franklin midway through the first quarter, with the Tigers free agent stretched from the ground, his season almost certainly over. The Tigers now have a game's break over the Swans, who entered the game second on the ladder, and West Coast, although the Eagles can close that gap if they defeat the Crows at Adelaide Oval on Saturday. The Swans' loss could yet get worse with Franklin likely to face MRO scrutiny for an open-handed shove to the neck of Alex Rance early in the third term, which resulted in a free kick to the Tigers defender. 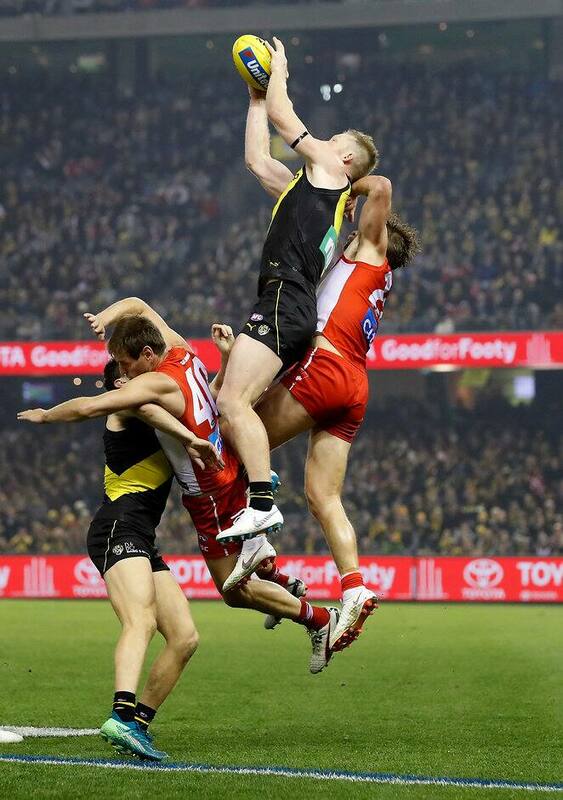 Richmond defender Nick Vlastuin appears to be in the same boat after he threw an elbow that caught Luke Parker high in the third quarter. Vlastuin was not looking at Parker, who was standing behind him, but the MRO takes a dim view of players that throw elbows. The much-anticipated contest between Franklin and Rance did not quite live up to billing, although it had a couple of flash points. After Franklin's shove to the throat, Rance appeared to get one back on the Swan later when he smothered a set shot from outside 50m. But the Tiger was pinged for overstepping the mark and Franklin took advantage of the resultant 50m penalty to goal from point-blank range after the three-quarter siren. Franklin finished with four goals to claim the points over Rance, although he was not at his devastating best. Toby Nankervis (18 possessions, 41 hit-outs and 10 tackles) decisively won his ruck contest against former teammate Callum Sinclair, while Kane Lambert (27 possessions and three goals), Shane Edwards (23 possessions and one goal) and Trent Cotchin (26 possessions and six clearances) powered the Tigers' midfield on a night when Dustin Martin was well held by Swans tagger George Hewett. Vlastuin (22 possessions, 10 marks and nine one-percenters) continued his good form in defence, and Jayden Short (two goals and seven inside 50s) gave the Tigers plenty of drive from half-back. "It was a full-on game," Richmond coach Damien Hardwick said after the match. "That first half was brutal. I remember saying to the boys at half-time that it was just a great game of footy to watch. I thoroughly enjoyed it. "It was contest after contest, tackling pressure … I think it was all of the things that make our game great. I love the fact the ball goes to a contest and then the great players play. "I thought we got to see a high-quality game of footy. That's what our game is all about." The Swans loss ended a six-game winning streak, while they had won their previous two games against Richmond. Coach John Longmire said the Tigers' ability to punish his team's mistakes had been decisive. "The game was essentially about the turnovers and their ability to score on turnover versus ours. They were able to score on turnover a lot more efficiently than what we were," Longmire said. "We normally stop teams a bit better on turnover than what we did tonight. "At the 10-minute mark (of the final quarter) we were a kick down and we were right in the hunt. "They got a couple of centre clearances in that last quarter, which they were able to score from and they continued to outwork us on turnover." Josh Kennedy (a game-high 37 possessions, eight clearances and nine tackles) led his team from the front as Sydney won the clearance count 39-31. In addition to keeping Martin on a short leash when the Tiger superstar was stationed in the midfield, Hewett had 20 possessions of his own and a game-high 10 clearances. Jake Lloyd (33 possessions) and Luke Parker (23 possessions and two goals) were also solid performers through the midfield. Richmond: Reece Conca was stretchered from the ground in his 100th game after appearing to suffer a broken left ankle midway through the first quarter. After the game, Richmond coach Damien Hardwick said the club was still unsure of the severity of Conca's injury. Captain Trent Cotchin spent 15 minutes off the ground during the first term after suffering a knock to his knee, but returned soon after and played out the game. Sydney: Isaac Heeney copped a knock to the head in the second quarter. He returned to the ground but was taken out of the game midway through the third term with suspected concussion. Coach John Longmire said after the game Heeney had passed a concussion test at half-time, but his condition had deteriorated during the third quarter. Luke Parker suffered a knock to his right elbow when Richmond defender Dylan Grimes collided with him early in the third term, but played the game out after having the joint strapped. The Tigers host Adelaide at the MCG next Friday night, when they will hope to avenge their 36-point loss in the Grand Final rematch at Adelaide Oval in round two. The Swans host Geelong at the SCG next Thursday night, having won four of their past five clashes against the Cats.